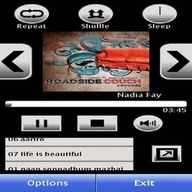 Zene Music Player Demo free download for Symbian s60 3rd and 5th edition. Musicby: musiXmatchDescriptionLyrics by musiXmatch is a deep dive into the world of song lyrics. This application lets you match lyrics to your own music collection, instantly search for the lyrics to any song and always have a current chart of top lyrics country-by-country. Entertainmentby: SyntoneticDescriptionLet your music match your mood! Moodagent is the intelligent music player that creates perfect playlists from your local music library. Give Moodagent a starting track or adjust the 5 mood sliders, and you ’ll instantly get a playlist of matching tracks. You can even launch a series of online recommendations that resembles the musical and emotional characteristics of the playing track. Utilitiesby: NokiaDescriptionNOTICE! " Launch " button does not work for a screen saver. Activate NSS from Settings- > Themes- > Screen saver menu by selecting " Sleeping Screen " . Social networksby: NimbuzzDescriptionNimbuzz is free calls, IM, chat rooms and social entertainment, all in one place! It's all you need to communicate for free. Call, text and share files with contacts on other networks such as (Yahoo!, MSN, GoogleTalk, Facebook, AIM, MySpace, Hyves) . Connect your SIP account or use NimbuzzOut and start making cheap international calls! Happy Nimbuzzing! Entertainmentby: picoBrothersDescriptionTalking Hamster is a voice-altering app that features an animated hamster, that repeat what you say in high-pitched squeaky voices in real-time. This app gives you hours of hilarious laughter. Features also Happy Birthday son. Entertainmentby: picoBrothersDescriptionPuppy talk is a voice-altering app that features an animated puppy dog, that repeat what you say in high-pitched squeaky voices in real-time. This app gives you hours of hilarious laughter. Utilitiesby: Opera SoftwareDescriptionThe Opera Mobile browser gives you the best browsing experience. Opera Mobile is a fast, smooth mobile browser. With Opera Mobile, browsing the Web on the go is more fun than ever. Opera Mobile has a new user interface that gives your device a sleek, modern appearance. You can also share web content from Opera Mobile on social networks. Utilitiesby: CrimeanDescriptionSymDVR is video recorder utility with wide functionality onboard. Some of key functionalities are: record videos non-stop, record in background, acquire and log GPS info, write subtitles with date-time and GPS data. Also it has favorites functionality which help you to save important videos to separate folder on the fly. till now i never use this. Its my first experince .after my wathing i'll comment.please try 2 understand.